I'm a student at the University of Furtwangen in Germany. I am in my final term and I am writing my thesis now. I'm very interested in iBeacons and the technology behind them. My current project is to compare the beacon technology with other technologies like GPS, Wireless-location, GSM, and NFC. For my thesis, I will create different use-cases and compare the results. Over the last few days I've tried to determine my position in a room. I use the relative distance (accuracy) from three beacons and gave every beacon a fixed position in my room. 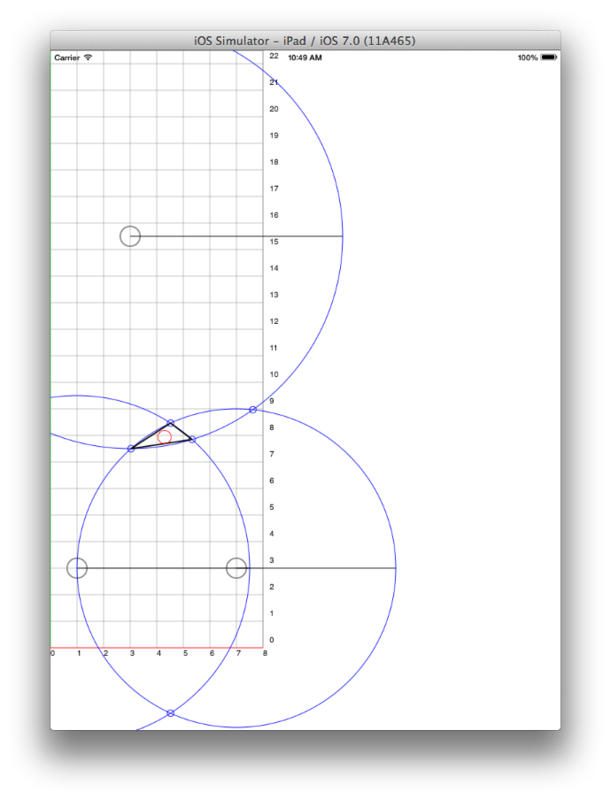 I get three circles and calculate 6 intersections. When a radian (accuracy) is too low I increase this value artificially. Then I look which of the 6 points (intersections) are the nearest. (The three nearest points) With those points I get an triangle, and with this I calculate the middle point. My problem is that the result is not really the best. but I have am having trouble implementing this in Objective C. But I understand the solution. How can I import or get this in Objective C. I found some libs (C, C++) but I'm not really sure which of these libs is the best. The best solution for me will be a Objectice C math library which can calculate with these points (x1,x2,x3, -- ,y1,y2,y3, --- ,r1,r2,r3). I was struggling with the same problem, then I found this solution, written in python. I tried porting the code into objective-c and using the same case for testing and the result is accurate. I modified the code so it can accept 2-dimension vector as well. I've tested by drawing on cartesian diagram using the test case data above, and got the result that the unknown point is located at (8,4), then testing using the code above and got the result (7.999978,4.000021710625001). The manual result is (5,5), and the result using the code is (5,5). So, I believe the code is correct. Not the answer you're looking for? Browse other questions tagged objective-c trilateration or ask your own question.